Who will you be AB 2019? My obligatory "Who will you be?" thread. Never too early to be thinking about your lineup! Re: Who will you be AB 2019? Oh boy I was ambitious this year! My lineup is still very much up in the air so I'll probably update this at a later date!! For right now the only one I'm certain of is Anthy in her Rose Bride dress from Revolutionary Girl Utena. Right now heavily leaning to once again bringing out Hanayo from LoveLive! because school uniforms last forever and her 'gym' clothes were the most comfortable cosplay evah!! Last edited by sunflower_king on Wed Jan 02, 2019 10:28 pm, edited 3 times in total. Grabbing the theme this year and hitting the ground running! i'm leaning towards just being tamaki all weekend because of budget restraints and comfort levels. still unsure though. Good gracious this has changed so many times already, but in no particular order: Soul from Soul Eater, Noctis from Final Fantasy XV, Chat Noir from Miraculous, Pidge from Voltron, Deku from BNHA and Tenten from Naruto. I'm still new to cosplaying, I started in Washington DC (Otakon) as Mina Ashido back in August! But I'm currently working on a human Okami Amaterasu, I'm rigging Divine Retribution with lights (non twinkling). That'll probably be my only one (I'm most excited for it) unless I can convince a friend to go as Bowsette so we'll be Bowsette + Booette, or alternatively Yumeko Jabami and Mary Saotome from Kakegurui! I was Nick Wilde (Zootopia) last year, and was going to bring my Inkling Boy (Splatoon) cosplay, but missed out on Saturday due to sudden illness. That being said, this year I'm definitely bringing the squidkid, as well as some Haida (Aggretsuko). Will definitely make both days as well, with the assistance I've gotten with the usual con sickness. Good taste. 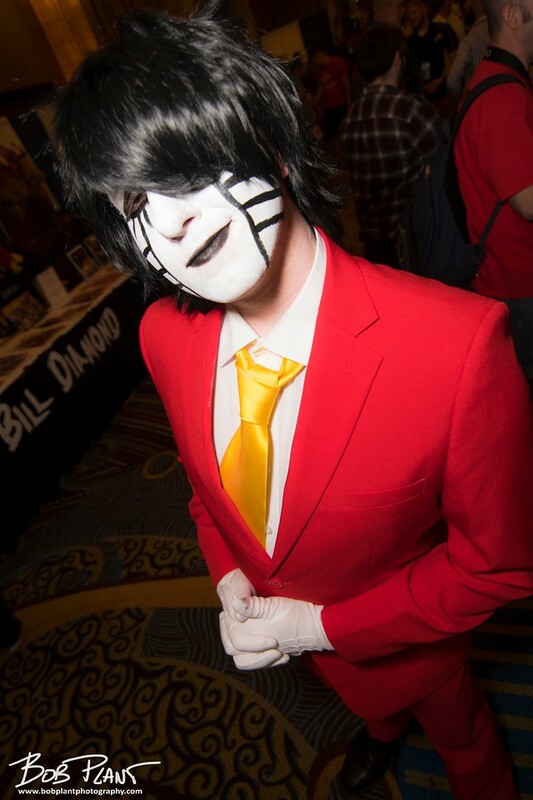 I did this exact cosplay for a local Comic Con a couple years back. As of right now I'm bringing Danny Fenton/Danny Phantom. I'd like to bring another cosplay but I'm not sure which one considering expenses and time. Right now, I'm working on Trevor Belmont from Netflix's Castlevania. I may also revive Prompto from FFXV. Killua from HxH and Yato from Noragami. Not sure on the days yet, but I did sign up for a handful of cosplay games. I'll once again be going as David from Camp Camp. Still flexible regarding who I'll be wearing on which days. Going to attempt to go all out with Kingdom Hearts Cosplay! Sora (Blue drive KH III) and young Xehanort (chess ver). 7th year at anime Boston! And once again, I've changed it around, but this is my final lineup. I'll be Clair from Fire Emblem Echoes and maybe Performing Arts Olivia/Bunny Lucina from FEH (depending on what I get done)!! Not sure what days I'll be wearing what yet but if anyone wants to meet up for FE pics or something feel free to hit me up! My medication I'm on makes me overheat if I stay in one cosplay too long so I take a break in the room and change into a new cospaly to air out the (most likely) now sweaty one. I also just need the break away from everything, even if it's for a moment. I've been going to cons for so long now that I need these breaks haha. Yeah, I get the same thing kinda. Never really stay at a con for more than 3-4 hours at a time, unless there's one of those "quiet areas" where I can chill for a bit. Oh yeah as someone who's worn a velvet lined pleather cat suit in summer more than once, I know that feel. I may or may not bring back my Ennoshita(Haikyuu) cosplay as well. Last edited by nekropunx88 on Sat Mar 02, 2019 7:38 am, edited 1 time in total. Saturday: Gray - Fire Emblem Echoes: SoV | Sunday: Issei Matsukawa - Haikyu!! Really looking forward to AB! If you will be doing meetups / photo shoots for any of these series feel free to drop me a message! I'm actually playing it a bit safe with my lineup, although I'm gonna try to fit in one more cosplay potentially! Friday, I'm going to be school uni Todoroki most/all of the day. Saturday the plan is school uni Kaminari all day! I'm only doing Wei Wuxian from Modao Zushi for sure! wei wuxian solidarity ... im cosplaying the yiling patriarch version of wei wuxian for all three days but i'll also be reprising minato arisato again for the persona meet-ups and shoots !! Here's my lineup! Does anyone know when the con opens on Friday? Does anyone know when the con opens on Friday? I think it opens around 8am. At least, when I went last year, I got there exactly at 9am and there were already lots of people inside. Most events don't start until around 9am, though. thank you! I'm coming in on Friday so I wanted to know depending on how late I'd be. If I recall the artist and dealer room don't usually open that early right? Hey guys for AB19 i'm debuting two brand new cosplays and re-wearing one of my favorites from last year's con. On Friday I'm planning on being Baby a.k.a Circus Baby from FNAF Sister Location. On Saturday I'm planning on being Maria from the SyFy show Deadly Class, in her Kings's Dominion school uniform. On Sunday I'll be re-wearing The Lost in her Dorothy outfit from Living Dead Dolls The Lost in OZ series. If you spot me on the floor or in any of the panel/screening rooms, feel free to say hi I love meeting new people and making some new friends.